The weather is just on the change and Spring is just around the corner. Now is the time to get all your hive parts in shape. Over the next few blogs we will cover what to do with old worn bee hive parts and how to keep them serviceable. Here we will talk about your hive roofs. It’s easy to forget these and they are the important over all protector of your hive, so they need a little TLC ever so often. Rust can form on the steel roof cover and if left untreated it will soon eat away at the metal and holes will appear allowing water inside the bee hive. At this time of year we always get to work to ensure the roofs go into the winter clean and sound. 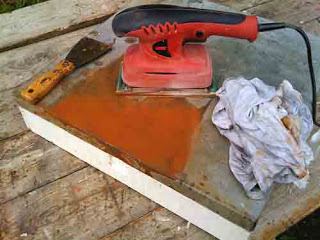 First if you do discover rust forming on the metal cover use sand paper to remove the rust. A hand orbital sander is much easier and well worth the expense as you will be sanding other hive parts from time to time and this will cut the time spent sanding by half. After you remove all the rust treat the metal lid cover with WD40 or a similar anti rust oil formulation. Rub it well into the metal and leave it to soak in. Use a blow torch to heat treat and sterilise the inside of the roof. Wipe the wood clean with a rag. If the inner ventilation mesh is damaged, replace it. Now’s the time to sand and repaint or restain the roof wood parts. That’s it! Your roof is ready for the long wet months ahead. Do the same in the Autumn and your hive roof will last many many years to come.